Intent: To submit a balanced counter to interdiction fields, allowing some chance to counter while allowing for the realistic possibility of failure. Gravitic Destabilizer: A strange product of heavily modified null quantum field technology, the Null-series projects a targeted field via tensor beams that destabilizes any artificial gravity wells currently being projected. This module requires an immense amount of energy to power, and depending upon the size of the module is less effective against larger interdictors. A cruiser sized destabilizer would be unable to disrupt anything larger than a destroyer, a destroyer would be unable to disrupt anything larger than a battlecruisers, and it would take multiple battlecruiser sized neutralizers to seriously hamper a star dreadnought with interdiction capabilities. Interdiction Begone: The Null-series utilizes modified hyperspace technology to disrupt the process of artificial gravity wells, effectively generating gravity shields that render these artificial anomalies inert and unable to effect realspace around them. E-War, So What? : By targeting the interdiction field catalyst itself instead of the systems generating it, a gravitic destabilizer bypasses the robust countermeasure suites interdiction vessels often come equipped with. Combat Range: The Null-series must be within standard turbolaser range before it can effectively shut down a gravity well generator. If it pulls out of range, the interdiction field will reinitialize. Power Draw: Requiring large amounts of energy to operate continuously, any ship operating the module must take rating penalties to armament, defenses, or speed. Taking significant damage can interfere with its effectiveness. Point to Point: Due to its tensor field delivery system, the Null-series can only disable one interdictor at a time. Multiple interdictors require multiple neutralizers. Scalability: The Null-series only fits on capital vessels. In addition, there is an upper limit to its ability to interfere with larger targets. A corvette is unable to disrupt anything larger than a frigate, a frigate cannot effective anything above a cruiser, a cruiser is unable to neutralize anything bigger than a destroyer, etc. An ingenious if peculiar device to emerge from the Metrobig Salvagestuff Platform, the Null-series Gravity Well Neutralizer does exactly what it says it does. Through a blend of null quantum field and tensor beam technology, the neutralizer generates a containment field that directly counteracts the debilitating effects these artificial gravity wells have on the surrounding region of hyperspace. Targeted at combating advances in interdiction technology, it is perhaps no surprise that such a devious countermeasure would find its birthplace in the lawless Outer Rim. Known for their peerless understanding of tractor beams and uncanny compulsion towards tinkering, the Squibs developed this module after inter-consortium infighting led some innovative salvagers to employ gravity wells around any newfound claims, effectively cutting off their competition. Keen to free up the market, the first gravity well neutralizer was invented, and soon the Squibs were launching raids on each other claim's from light skippers outfitted with a HIMS to punch through the field, and a neutralizer to escape it. Naturally, it wasn't long before the wider galaxy caught on to the obvious military applications of such a device, and it soon fell in the hands of Skor's Coalition partners. Check one two. Is this thing on? It's been a while. As most of you know, this group was well on its way to becoming the Jedi Academy Network of rebel minors. But sometimes fortune conspires to challenge our expectations, and now we find ourselves in the unique position of being able to resume our close relationship with ORC and in so doing reclaim the Galactic Alliance's ancestral homeland. You may have noticed that there is a new faction thread up. This will mark the prelude to a Coalition dominion campaign that will hopefully culminate in the acquisition of Sullust. Instead of ragtag exiles constantly on the run, we'll be ragtag exiles taking back our home and starting over. I understand that this is a sudden shift from the way things were going, and may interfere with certain writers' plans. Some of you have already established your characters in other factions, holding on to your AiE badges and making the Alliance your own thing. I don't want to mess with any of that, so any splinter groups or foreign chapters will not be challenged, but welcomed as brothers and sisters. Everyone is free to continue their dual citizenship, as members of the Alliance and wherever you wound up, but if you would prefer a fresh start in a different environment we wish you all the best and hope you will continue to think of us as close allies at the very least. Intent: To submit a ridiculous idea as a support fighter for the Squib Reclamation Fleet. Spark Booster: An extraordinarily complex, proprietary piece of Squib technology, functionally equivalent to an afterburner. When activated, the capacitor floods the craft's sublight reactor and jettisons the Gullwing forward at breakneck speeds. Should the user encounter any temporal anomalies, please contact the manufacturer to arrange for a recall as the product is defective. Where We're Going, We Don't Need Roads: The Gullwing-class is a compact, two seat starfighter that is also capable of performing in a dual role as land transport. Thanks to Squib ingenuity, this little undersized snub craft transitions seamlessly from road travel to liftoff. We've Gotta Go Back: A short range fighter, the Gullwing doesn't have sufficient fuel capacity for prolonged trips through hyperspace, nor would it be a particularly comfortable ride for long journeys. 1.21 GIGAWATTS: Activating the starship's hyperdrive requires practically all its power reserves, requiring every system except for sublight and life support to be deactivated before initiating a jump. Additionally, the ship must accelerate to at least 88% maximum velocity in order to successfully break through into hyperspace. One of countless cobbled together horrors to come from the Metrobig Salvagestuff Platform above Skor II, but undeniably iconic, is the strangely conceived Gullwing-class Starfighter. Essentially based upon an ancient Corellian land rover design, the ingenuous Squibs hollowed out most of its internal components to make room for a sublight reactor and hyperdrive. Sealing the frame up enough to maintain pressure seals, they slapped a pair of twin laser cannons on the front and an ejector seat inside, then promptly spent the rest of the project budget on making the ship go faster. The Gullwing is one of the strangest ships in the galaxy, but its ability to transform from air to land vehicle without any reconfiguration makes it undeniably useful. The Reclamation Fleet has come to rely on their use as support for the standard needle fighters, cherished for their high speed, low sensor profiles, and ability to perform radical stunts with. Intent: To submit a Batcave for Titus in the Tython system. Accessibility: Nestled in the center of Ashla's Sanctity Crater, Lightsreach is easily approachable but gaining entry is another matter entirely. Automated air defense turrets surround the perimeter, and three to five legions of armsman as well as fully trained Jedi Knights guard every conceivable entrance. The Oathsworn are mistrustful of outsiders, any trespassers would either be attacked on sight or taken prisoner for ruthless interrogation. Description: Built off the foundation of an old Galactic Alliance research outpost, Lightsreach Citadel has been converted into a mixture between a house of worship and a paramilitary facility. Maintaining the base's neo-futuristic architecture, once spartan corridors are now arrayed with ornate tapestries and heraldic pennants. Consecrated Ground: A product of hosting such large numbers of Jedi crusaders over an extended period of time, this effect is not at all dissimilar to an aura of battle meditation that radiates throughout the compound. Light's Aegis: The light is so strong in this place that any loyal to its call are able to summon a Force barrier with little to no concentration, as well as construct more elaborate shielding when multiple Jedi combine efforts in a kind of barrier ritual. Balance of Nature: Tython is consumed by eternal war, and its soul lashes out in retribution. The Force is unstable here, using one's abilities is like tossing around wild magic. Most of the time a desired effect will be produced, but sometimes its power output will be considerably less or more than the wielder intended, and occasionally entirely unexpected powers will manifest instead. Deep under the lunar surface at the heart of the Citadel proper, from this tactical strategium Regent Lord Valerius directs his Oathsworn Legions across Tython and the rest of the system. Sitting atop a raised circular dais at the center of the situation room is an ornate looking command throne, emblazoned in electrum carved sigils. A special chamber within the facility's Church of the Force cathedral, the altar is watched over by a team of six trained Jedi Consulars. Due to the sympathetic Force connection between Tython and its twin moons, these Consulars are able with great ritual preparation to fold space, sending up to a small group of individuals from Ashla to the surface of Bogan or Tython below. Although not vast, an Alliance hangar remains which is used to store and maintain the Oathsworn's growing fleet of single system starfighters and small attack craft. Variously salvaged from wrecks or cobbled together uglies, it is the Regent Lord's emphasis on mobility that allows his Legions to project their strength from orbit. Lightsreach has entered into a mutual defense compact with Lord Sardun's Band of the Silik to help defend their seized orbital manufacturing facilities in exchange for some of the tech produced there. Although Lightsreach only takes up a small portion of the crater, many civilians traveled along with the initial Oathsworn exodus and have since established Hope Colony several dozen kilometers away at the crater's edge. Using the ancient ruins which cover much of Ashla as a foundation, since then a small industry has grown out of providing basic services and amenities to the Citadel's warriors. When Knight Valerius began receiving visions compelling him to make a pilgrimage to Ruusan, he took leave of his master Talanis Long and journeyed to the Valley of the Jedi. Many of his devotees speculate on what exactly he witnessed there, all that is known for certain is that when Valerius returned to Tython he was a changed man, a man with a grand and seemingly impossible dream. Gathering his own followers from among Long's subjects and the pilgrims of New Kaleth, Titus convinced this first Oathsworn Legion that he had been in contact with a lightside entity known only as Lord Amroth. Although such a feat at this time, so soon after the fall of the New Jedi Order was considered practically impossible, the Jedi convinced his followers to construct a ramshackle exodus fleet with the intention of recolonizing Ashla. Before his grand expedition departed, Lord Talanis released Titus from his service and anointed him Jedi Master. It was a team of survey scouts that initially discovered the abandoned Alliance outpost. Declaring this to be their new bastion, Valerius proclaimed himself Regent Lord of the Oathsworn Legions, contending that their true master was the enigmatic Lord Amroth and that he continues to receive communications from the entity in the form of cryptic omens. Over time what became known as Lightsreach Citadel has been converted into a fortress redoubt and main sanctuary of the Compact. Intent: To submit a set of personal armor for Titus Valerius. Crystal Pauldrons: Encrusted on each shoulder plate is a cluster of spiritually active Force crystal shards, each imbued by master forgewrights to store a single charge of barrier which can be consumed at will. Holodisplay Gauntlet: A lone modern conceit fashioned onto the left vambrace of the armor's otherwise ancient design, this compact holopad device allows the suit's wearer to stay up to date on intelligence reports, activate a topographical map of their surroundings, even send and receive communications. 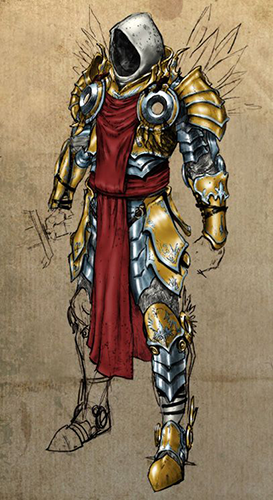 Ornate Guardian Armor: Crafted during an era when Jedi and Sith were simply distinctions on the battlefield, each Cuirass is far bulkier than the warrior monk equipment of today, not to mention more ostentatious. Their composition and the skill of their creators allow whoever dons them shrug off significant damage. Crystal Shards: By consuming the imbued energy within each of the pauldrons' inlaid crystals whoever dons this armor is able to manifest a Force barrier with little strain or concentration. Heavy Metal: This armor is extraordinarily heavy. Even the most powerful humanoids would suffer limited movement if they were to don it. This is not a suit of armor forged with agility in mind. Shatterpoint: Each pauldron only has a limited number of crystals to consume, and particularly powerful effects can overload individuals, triggering a chain reaction of eruptions that could even channel energy as feedback directly through the metal plate. Blind Spots: Even if its wearer could turn on a dime, there are significant gaps in their available peripheral vision and situational awareness. The Cuirass' of Crystal Dawn are thousands of years old, a set of ancient Jedi relics lost to the ages until an expedition led by the Oathsworn Reliquary liberated them along with a minor trove of archaeological findings underneath the surface of Tython. While the other artifacts were stored and catalogued the grandest of these magnificent sets of ornate Jedi Guardian armor was presented to the Regent Lord Titus Valerius, Master and Commander of the Oathsworn Legions. Decreeing that it would be unjust to let such a masterworks rust away unused in some dreary cellar, he instead removed his own handcrafted warplate and took up the mantle himself as one of the Crystal Dawn's chosen knights. Dispatching honor guards to convey the other sets to some of his most trusted fellows. Lord Valerius is rarely seen without his hauberk, an exquisite piece of artisanry that is nevertheless eminently functional. Perhaps the most notable facet of each cuirass is their crystal encrusted set of shoulder plates, jutting up from each pauldron like jagged spikes. After every battle any destroyed crystals are replaced with freshly harvested specimens from the Oathsworn's crystal mines on Tython. Some minor refurbishment has been permitted under the careful scrutiny of Vur Tepe, but for the most part the armor Titus wears today is much the same as it was when it was last consecrated in battle during the New Sith Wars.